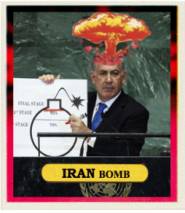 In this episode, Michael Talerico, a social democrat, and Shaun Maher, a conservative, discuss the implications of Benjamin Netanyahu’s speech to congress and its potential impact on the negations between the Obama Administration and the Iranians over their nuclear program. Various questions are raised in this episode: Is Iran trustworthy? Is Obama trustworthy? Is Netanyahu exaggerating the threat Iran poses to Israel? These and many other points are discussed in relation to this contentious issue.